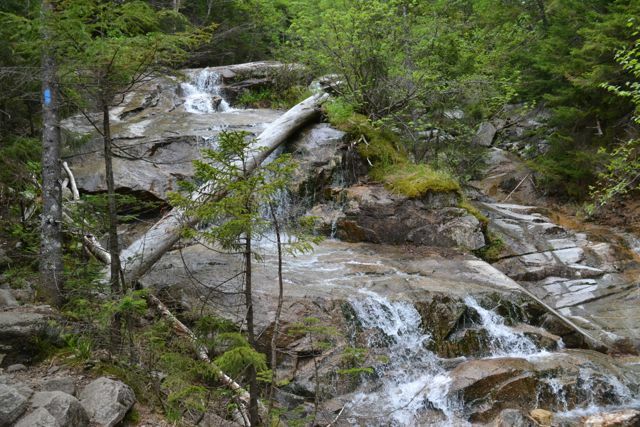 The Falling Waters Trail is the popular ascent route choice for the Franconia Ridge and one of the most popular trails in the White Mountains, attracting huge crowds of hikers every day. Despite its extreme popularity, the trail is long, steep, and rugged. An easier destination along the way is the 80-foot Cloudland Falls. And on the trip to Cloudland, you experience the trail's namesake, two other waterfalls and countless cascades on Dry Brook. The hike starts at the Lafayette Place Campground parking. Proceed 0.1 miles up the paved path to the trailhead. The two trails coincide for the first 0.2 miles in the forest, then Falling Waters Trail turns right (and you will follow) and crosses a bridge over Walker Brook. Falling Waters Trail crosses the brook and continues up into the forest at gradual grades for the next half mile. After a slight descent, it crosses Dry Brook. The trail, now fairly rocky, climbs parallel to the stream, soon passing Stairs Falls, a short and wide plunge. Just behind Stairs is Swiftwater Falls, a taller, winding cascade. The trail crosses the brook at Swiftwater, then begins to climb. After a half mile walk, the trail passes 80-foot high Cloudland Falls, the tallest and most beautiful of the three, where Dry Brook fans out gracefully over a cliff. The trail then ascends on the side of the falls, where you encounter steep rock slabs. At the top of Cloudland, you are rewarded with two more cascades at two converging brooks and a minor viewpoint of Mt. Moosilauke.